When you hear the term "room service," you may think of a luxury offering at a fancy resort. While this image wouldn't be incorrect, many healthcare facilities across the United States are altering the public’s perception of room service by offering their patients the ability to order restaurant-style food on-demand. Research has shown that facilities with a room service program in place can achieve higher patient satisfaction scores, as well as reduced food waste. In fact, according to a recent study conducted by the Academy of Nutrition and Dietetics, one healthcare facility in Australia was able to increase its patient satisfaction ratings across all Press Ganey categories by implementing a room service program. In addition, this facility was able to reduce overall plate waste drastically. Given the improvements a room service program can provide, it’s hard to believe that only 38% of healthcare facilities currently have a room service program in place today. So how can you get ahead of the curve and gain a competitive advantage with the implementation of a room service program? We’ve got you covered. This article will provide you with everything you need to know about room service programs in healthcare, and tips to get you started with a successful room service program of your own. When your patients enter your facility, they do not stop being human beings. As you know, humans like the ability to make their own decisions regarding food choice. A successful room service program will allow your patients to order restaurant-quality food, and have it delivered in 45 minutes or less. This elevated level of service will provide your patients with a sense of empowerment to eat when they want, and what they want and this, in turn, leads to increased patient satisfaction scores. When it comes to room service increasing patient satisfaction scores, there’s proof behind the pudding. According to Food Service Equipment & Supplies, the implementation of a successful room service program can lift customer satisfaction scores to the 90th or even 99th percentile, which can transform the entire image of a facility for the better. As a food service worker, you understand the importance of reducing plate waste. Giving your patients the ability to choose their meals from a restaurant-style menu could be the answer to drastically decreasing food waste. In fact, a recent study by the Journal of the Academy of Nutrition and Dietetics found that a room service program can reduce plate waste by more than 29%. That number is hard to deny. As we previously discussed, a room service program allows patients to eat what they want, when they want, (within dietary restrictions). This sense of empowerment usually results in patients eating better and thus improving their overall nutritional intake. A recent study by the Journal of the Academy of Nutrition and Dietetics found that a room service program can enhance patient dietary intake by 17%. It’s important to remember that healthy patients equal happy patients. If a room service program can help you increase the well-being of your patients, implementing such a program at your facility is a no-brainer. When patients order what they want, and how much they want, fewer meals are returned uneaten, which results in reduced patient meal costs. According to Sodexo, facilities that implemented successful room service programs saved between $7 and $8 per patient per day. A separate study by the Journal of the Academy of Nutritional and Dietetics found that a room service program can decrease overall patient meal costs by 15%. Given these numbers, the potential savings your facility could experience by implementing a room service program is something upper-management will have a hard time overlooking. Implementing a room service program is hard work, and it will take proper planning. The decision to transform your foodservice program should not be taken lightly. So where do you begin? We've got some tips to help get you started. Before you jump into starting a room service program, it’s important to make sure the switch is right for your facility. Things such as labor needs, equipment, software requirements, finances, facility space, and stakeholder buy-in should be accessed before investing money in the transformation. Seek the answers to the following questions to help you determine if implementing a room service program is a smart move for your facility. What does staff think about the switch? Do you have a leadership strategy? Do you have the infrastructure and communication lines in place to support the transformation, or will you need to invest resources to create this infrastructure? Do you have an experienced culinary team that is ready to take on the endeavor, or will you need to hire industry professionals? Do you have the necessary software in place to successfully run a room service program? Do you have experienced customer service personnel in place to run and manage the program once it is implemented? Can your kitchen be modified from the traditional trayline to galley-style cooking and serving areas essential for the room service concept? The key to starting a successful room service program is making sure everyone at your organization is on board and accepts and believes in the idea. At the core, a room service program will change the way your facility approaches patient care. Implementing a successful program will require all departments at your facility to work in coordination to bring delicious, safe, and high-quality meals to your patients. You may find it challenging to work around everyone's busy schedules, but the time and effort will pay off in the end. You should aim at having one meeting per week with key stakeholders to get the project off the ground and if you find yourself in need of some additional expertise, one of our four teams may be able to hammer out some of the gritty details that sway management’s opinion. Did your labor costs increase significantly? 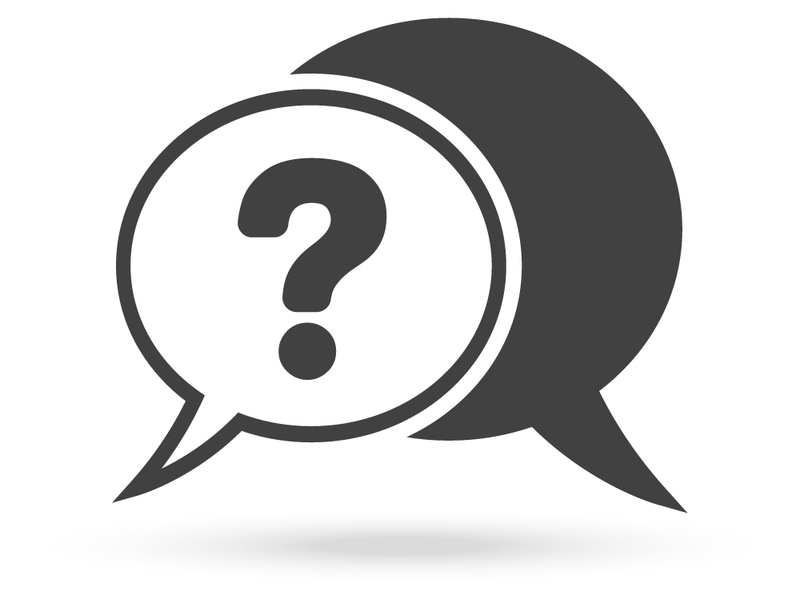 What changes did you have to make concerning equipment and physical space? How much did you budget for new equipment and new staff? What did you do if you did not have the culinary talent present at your facility to support a successful room service program? What effect does your room service program have on your staff’s morale? What effect does your room service program have on patient satisfaction? Did you have to invest in additional software to support the program? What training did you conduct to get your staff ready for the transformation? Did you enlist the services of a consultant to help you make the switch? If so, do you have a recommendation for us? Creating delicious and nutritious food is critical to the success of your room service program. That’s why it’s essential to have the right people in place to run your kitchen. If you do not have classically trained chefs working at your facility, you will want to hire an executive chef to help build your program. This individual must have exceptional knowledge and passion for food, as well as experience in production management, customer service, and leadership. In addition to hiring an executive chef, you will need to implement a culinary recruitment program to help you find trained and experienced cooks with backgrounds in the restaurant and hospitality industries. You cannot afford to settle for cooks without experience. The success of your room service program will depend on you hiring the right talent from the start. 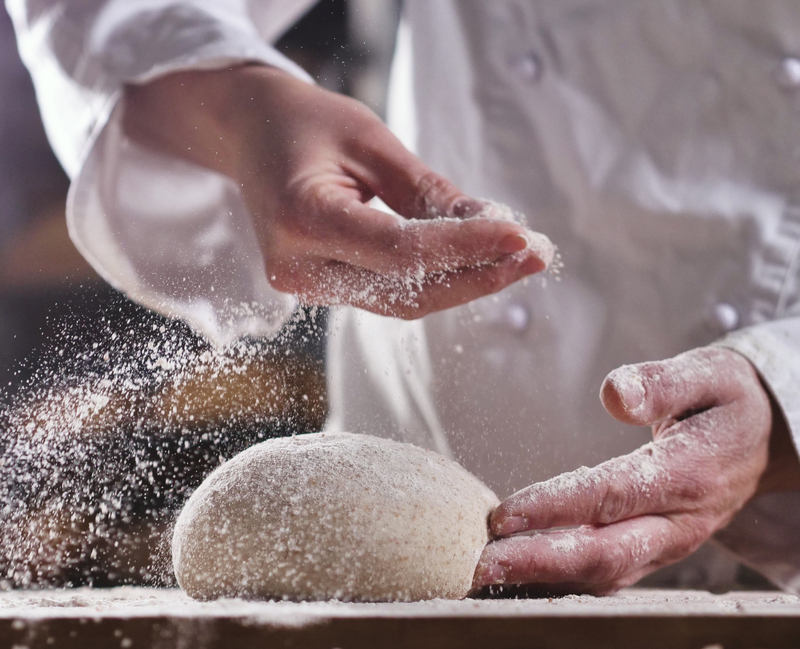 Before you can launch a successful room service program, you need to establish production procedures and have structures in place to help you navigate through daily tasks once the program is launched. Consider creating daily production sheets, food standards, portion and waste control sheets, and cleaning checklists. Having these elements ingrained in the daily routine will lead to success for years to come. One thing that can make running a room service program much easier is automation. If you have the capital funds necessary to purchase software to help you automate this service, highly consider it. Automation can provide your organization and patients with greater flexibility in food offerings, as well as offer repeating room service deliveries, daily specials, and even tv meal ordering. Automation can save you time and money and be a high selling point for potential patients and their families. Before attempting to implement a room service program on your own, consider enlisting our services to help you make the switch less painful. Our consultation teams can bring forth a wealth of knowledge and experience and can help you stay on track to complete milestones like equipment recommendations and POD system layout drawings of your kitchen. They can even assist with developing menus, recipes, policies, and procedures, and also assist with the implementation of training programs. An experienced culinary or custom design team can save your facility a significant amount of time and stress during your foodservice transformation and increase the likelihood that your program is a success. Most healthcare operators state that you don't need a lot of equipment to start a room service program; however, if you're serious about starting a room service program, you need to make sure you have the necessary equipment in place to aid in your success. From foodservice delivery carts and non-skid meal trays to food storage bins, condiment caddies, and silverware sleeves, we have you covered. Consider these high-quality foodservice items to help make your transformation to room service a successful one. To keep your residents happy, you must invest in a quiet room service delivery cart so you do not disrupt your resting residents when you’re out for delivery. 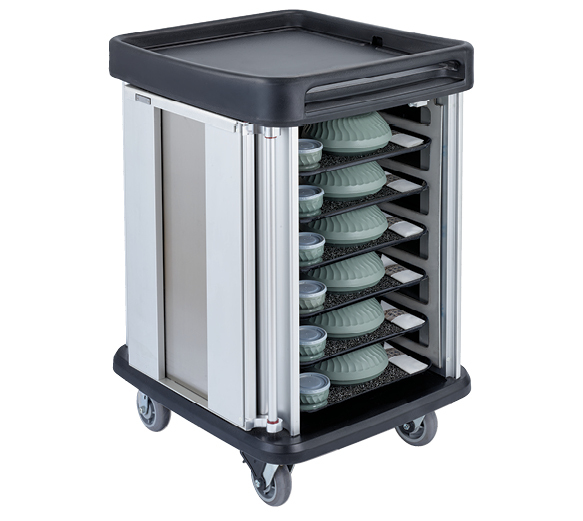 The TQ Supreme meal delivery cart is the perfect solution. This meal delivery cart encompasses a sound dampening design, and magnetic door lock to ensure you will not disrupt your resting patients after-hours. In addition, this aesthetically pleasing, noise canceling room service delivery cart can enhance the hospitality of your foodservice program by bringing a hotel-like atmosphere to your facility. Best of all, the TQ Supreme foodservice cart can be customized with your logo or other artwork. Slipping trays are a top concern within the healthcare foodservice industry. Dinex’s fiberglass non-slip meal trays will help you create beautiful setups and save money by eliminating the need for paper tray covers. 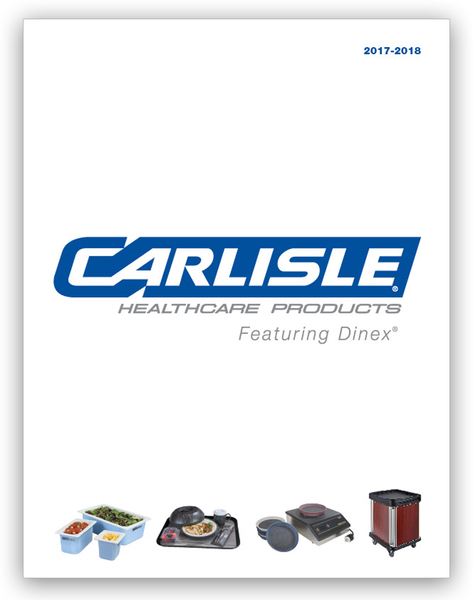 In fact, Dinex non-skid meal delivery trays could save your facility over one ton of paper waste per 100 beds per year! Keep more money in your pocket in 2018 and help out the environment by ordering Dinex non-skid food trays for your facility. Order your non-skid trays online today. 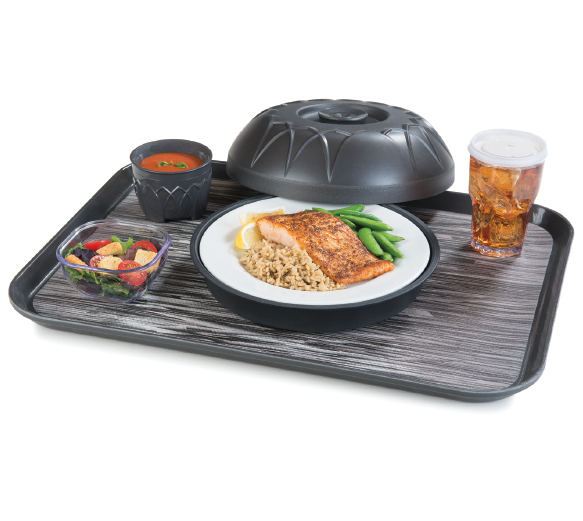 Elevate patient dining experiences and modernize your entire traytop presentation and serve more appetizing meals with our Fenwick Insulated Wares collection. Increase patient satisfaction scores with the sleek, sculptured design of Fenwick. Available in a variety of attractive color choices including our new contemporary Graphite. Keeping food stored at safe temperatures is a top concern for every healthcare foodservice provider. If you need to keep milk or other cold beverages at the correct temperature during meal delivery, look no further than Coldmaster®. 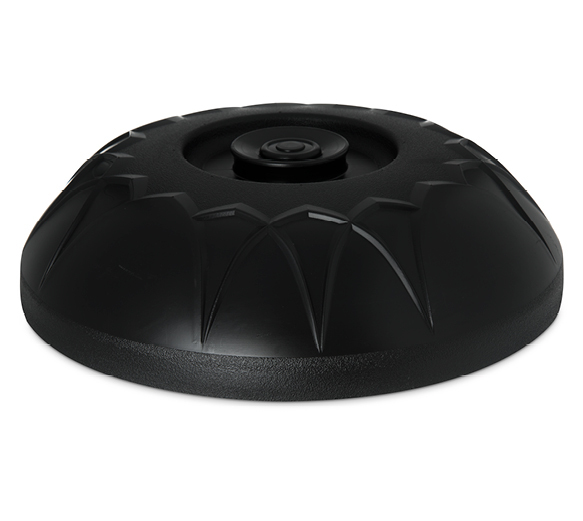 These insulated food pans can hold food at or below the food safe temperature of 40 degrees Fahrenheit for up to 8 hours. When drinks are no longer safe, the containers will change color from blue to white. Coldmaster® CoolCheck's color changing technology can give you peace of mind knowing that patients will always receive ice cold drinks. 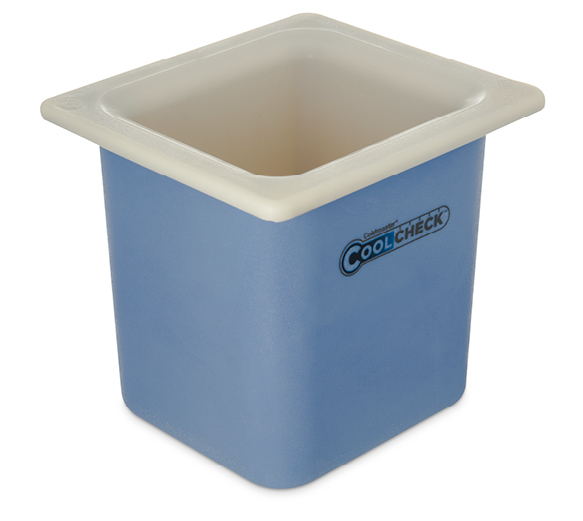 Take the stress out of meal delivery and prepare by ordering your Coldmaster® CoolCheck food pans today! No room service program would be complete without condiment caddies. 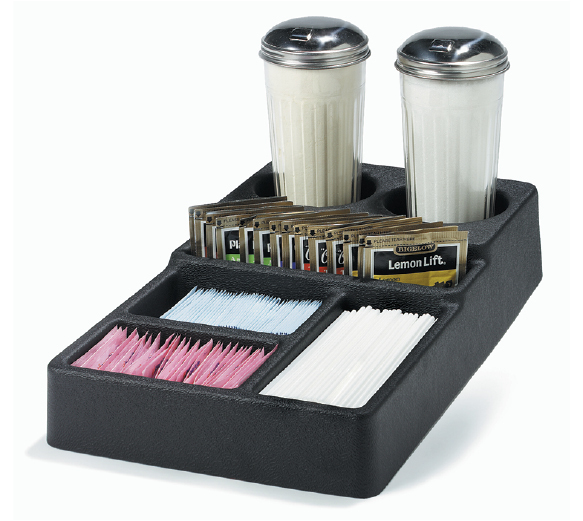 A condiment caddy will help you organize condiments and save precious space atop your meal delivery cart, while upgrading the look of your room service program. Order your batch of condiment caddies online now. Keep your utensils clean and provide an upscale look with our high-quality cutlery caddies. Our cutlery caddies are unique printed sleeves that come pre-loaded with a two-ply 16" by 16" Trimline napkin. Ordering silverware caddies can help reduce your labor costs associated with wrapping utensils, increase trayline efficiency, and eliminate the number of lost utensils during transport. Our beautiful silverware caddies come in three designs and are incredibly affordable. 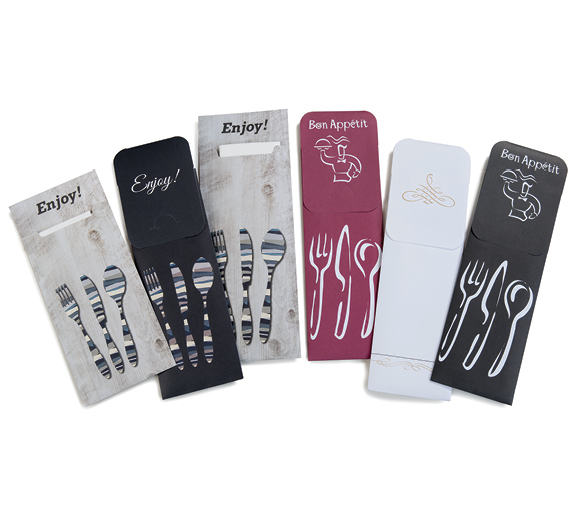 Order your set of cutlery caddies today! Implementing a successful room service program at your facility will not be an easy undertaking. It will take considerable planning, time, and resources. While starting a room service program can be challenging, there are things you can do to make your transformation easier. 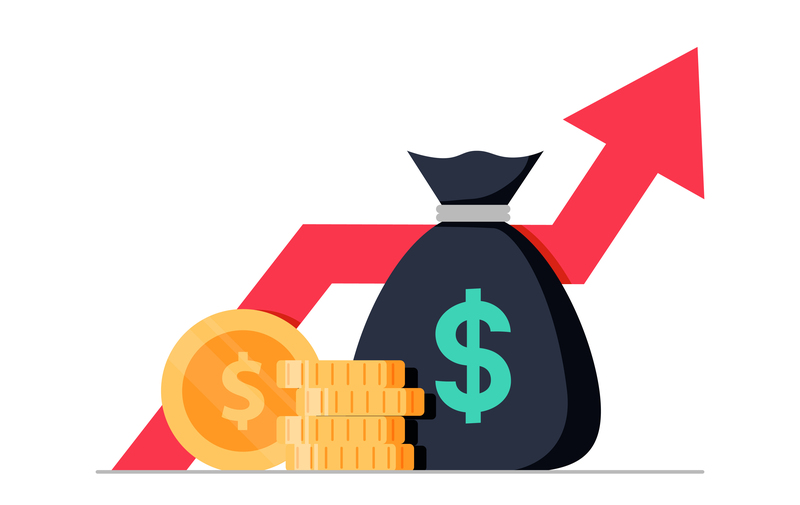 It’s important to keep in mind that a food service program may result in higher up-front costs, but the potential long-term savings associated with the implementation of such a program cannot be ignored. If you are ready to implement a room service program at your facility, check out all the foodservice equipment options we have to offer that can help you take your program to the next level.